Mayor of Rome Ignazio Marino met with AS Roma representatives on Thursday and both parties left the meeting satisfied. For Rome the now approved sporting-commercial development at Tor di Valle means roughly 3,000 jobs, though only some permanent. For Roma opening of their new 52,000-seater in 2017 is becoming more realistic. The club was also assured by Marino the site will be well-connected to public transport network by the first game. One of Rome’s subway lines is planned to reach Tor di Valle by 2017. Gialorossi will be given a 30-year lease of the grounds they are to build on. After that time the club will be entitled to buy the site ahead of any other parties. This doesn’t mark the end of Roma’s road towards the new stadium. 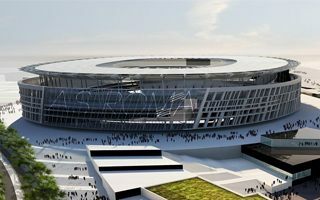 The project still has to be approved by the Lazio region authorities, though it’s expected to be a formality after Rome’s approval. It’s expected that work on site may be launched within months. “Yesterday was a day who will be important in Roma’s history, but we work every day to write little pieces of history,” he has said in an interview with Roma Radio on Friday.